Bottom tube width is 11.5"
For bikes with WIDE front ends. These are knurled, and ready for internal or external wiring. These do not include cables for the "roll off" feature. If you would like this feature it will cost extra. Please contact us PRIOR to purchasing! This kit is designed for controlling Harley-Davidson OEM components only. Kit includes brake, clutch, throttle, idle and wire harness extension kit. 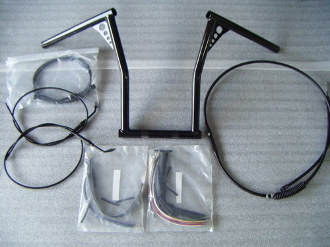 Check out our handlebars that will go with this kit and our other items! This kit is designed for controlling Harley-Davidson OEM components only.